Enjoy the discount. For science. Lately, Amazon has had some pretty awesome for gamers, like those discounts on Dead Space 2 and Doctor Who. However, Amazon's starting this week off with a pretty big bang for gamers this week. Today's special deal will likely thrill a lot of players, because Portal 2 is on sale. The deal is good across all systems. Currently, the PS3 and 360 versions are going for $34.99, while the PC version is selling for $29.99. Of course, it seems like the sale will only last for so long before supplies run out and the game goes back to the usual price. 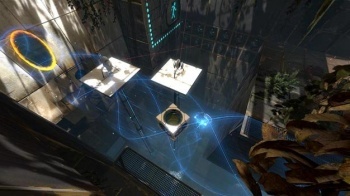 If you're not sure about picking up the game, check out our Portal 2 review. My suggestion, however, is to pick up the PS3 version, since it comes with a free copy of the PC/Mac edition (not to mention the fact that you can play with me once the PSN comes back up).